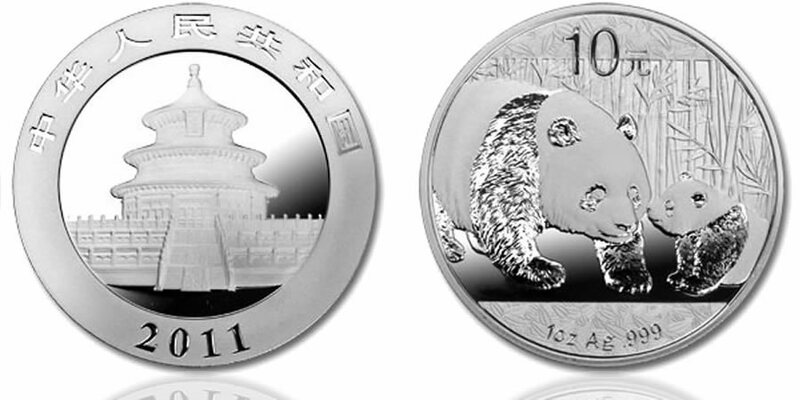 The Chinese Panda Silver Bullion Coin was introduced in 1983, one year after the launch of the popular Panda gold coin. Known around the world to investors and collectors, the coins are especially unique in that each year a new panda design is released. This typically results in higher premiums versus other world mint silver bullion coins. Silver pandas in the 80's featured different specifications. Notably, at least two different sizes and varying levels of silver composition (.900 and .925 fine silver). During most of the 90's, two versions were also minted -- Proof and Brilliant Uncirculated. Beginning in 1989 and to present day, the silver pandas are struck in .999 fine silver, contain 1 troy ounce, and have a diameter of 40 mm. Since 1998, the coins are only released in Brilliant Uncirculated condition. The obverse design, like the gold version, shows the Temple of Heaven in Beijing and the year. The 2011 Chinese Panda Silver Bullion Coin depicts an adult panda being nuzzled by one of its cubs. Inscriptions include the face value of the coin (10 Yuan), the size, the periodic symbol for silver "Ag", and ".999" for the purity.